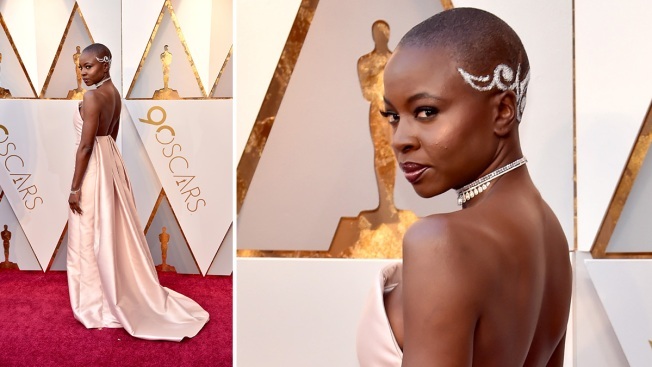 Danai Gurira attends the 90th Annual Academy Awards at Hollywood & Highland Center on March 4, 2018, in Hollywood, California. The star is lending her support behind an anti-poaching campaign. "Black Panther" star Danai Gurira has traveled to Zimbabwe to join a campaign aimed at protecting rhinos from poachers. The WildAid conservation group says Gurira, who mostly grew up in Zimbabwe, is participating in a publicity campaign called "Poaching Steals From Us All" that will run across Africa. Gurira appears in an anti-poaching video that opens with a scene from the "Black Panther" movie in which her character, Okoye, steps in front of a charging rhino that abruptly stops and licks her cheek. "We're losing our heritage and an important attraction for our tourism industry," Gurira says. She urges people to report wildlife crime. China and Vietnam have also been targeted in campaigns to reduce demand for rhino horn. Some consumers believe the horn can cure illnesses.